The St. Louis Cardinals and Kansas City Royals are meeting this weekend in Kansas City for the Center League lead. The Royals won the opener Friday night, 5-0, behind two homers by designated hitter Kendrys Morales. 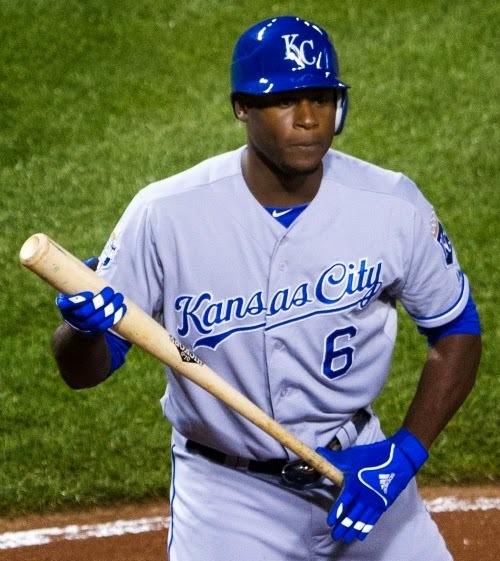 Kansas City Royals center fielder Lorenzo Cain enters Saturday's games with a 2.8 WAR, according to baseball-reference.com, second only to the Angels' Mike Trout among American League position players (Keith Allison/Creative Commons Attribution-Share Alike 2.0 Generic license). The key series of the weekend is in the Central League, where the St. Louis Cardinals and Kansas City Royals are meeting for the lead. It happens that the Royals have the best record in the American League (27-14) and the Cardinals have the best record in the National League (27-15), but it's the Cardinals and the Detroit Tigers with a half-game lead on the Royals in the Central League, even after the Royals carried a 5-0 win out of Kauffman Stadium in Kansas City Friday night. The Royals have advanced from mere feel-good story to real going concern in a very short time. One can tell they are real because they can replace real talent and keep winning. During the offseason, they lose their ace right-hander, James Shields, the player who, more than any other, lurched them towards credibility. Shields went to the San Diego Padres as a free agent. Instead, now, the Royals have Chris Young, who now has 69 career victories as he approaches his 35th birthday on May 25. Young threw six innings of goose eggs at the Cardinals Friday night, allowing six hits. He's 4-0 now with a 0.78 ERA. During the offseason, the Royals lost their long-time designated hitter, Billy Butler, to free agency. In his place, the Royals signed Kendrys Morales, who, being a switch-hitter with power, pretty obviously trumps Butler, who signed with the Oakland Athletics. Morales accounted for all of Kansas City's scoring Friday with a three-run homer in the first inning and a two-run homer in the third. The centerpiece for the Royals remains, of course, that core of young, veteran talent. It would be hard to pick just one, but, if you had to, it would probably be the center fielder, Lorenzo Cain. As of Saturday morning, Cain was second to Mike Trout of the Angels in WAR (2.7) among American Leaguers who aren't pitchers, according to baseball-reference.com. Friday night, Cain hit himself onto base twice so he could score on Morales homers. As of Saturday morning in the Central League, the Cardinals are 20-11, the Tigers are 23-14 and the Royals are 18-10. Now, 30 years after the Royals and Cardinals met in the World Series, they are meeting on the weekend before Memorial Day. Perhaps they will meet again in October.